"How is it that we know who we are?" Suture is one of those films that seems to be more than it really is. Essentially a black & white art film disguised as film noir, it vanished into obscurity after an extremely limited release in 1993. MGM has recently resurrected the title and added it to their potentially prestigious 'Avant-Garde Cinema' series. Unfortunately, some experiments, no matter how seemingly creative, still can fall flat. Suture was shot in black and white, and it certainly makes the film stylish and visually appealing. This is just one of many heavy-handed uses of contrast that attempt to make Suture come across as art. Rorshach inkblots appear throughout to reinforce the distinction between black and white, and how we look at things. Even the cast is not free from the experimental use of black and white. The basic setup concerns two estranged look-alike half brothers, Clay and Vincent. The art school premise of Suture relies heavily on the concept that Clay and Vincent are portrayed by a black actor (Dennis Haysbert) and a white actor (Michael Harris), respectively. Not only black and white, but two completely different looking individuals. These two could not look any less alike. However, as the viewer, we are supposed to suspend our disbelief and be intrigued by this contrast; even more so because in the world of Suture (a very antiseptic looking Phoenix, Arizona), they are truly identical. So much so that other characters can't stop commenting on how much they look alike. This is moderately interesting for about the first 10 minutes, and then it becomes inconsequential. Thin and weasel-ish Vincent Towers (Harris) is your basic wealthy, slicked back character that would have fit in perfectly in an episode of Miami Vice. In his luminescent white suit, it does not take a film scholar to realize that Vincent is evil—you can tell just by looking at him. When you see Cruella DeVille, you know she's evil. We learn that Vincent is also a suspect in the recent murder of his father, and that is what propels the film into it's Hitchcockian plotline. When long lost, working class half brother Clay Arlington (Haysbert) arrives, Vincent intends to continue his murderous ways. He will swap identities with Clay, and then kill him. By doing so, 'Vincent' the killer will be dead, and 'Clay' can disappear. Vincent attempts to kill Clay with a car bomb, but doesn't succeed. Clay, who now everyone believes is Vincent, awakes in the hospital with amnesia and his stitched-up face wrapped in bandages. The remainder of Suture deals with Clay's attempts to regain his memory and life, which everyone mistakenly tells him is that of Vincent. Plagued by disturbing dreams, Clay struggles to come to grips with who he is. 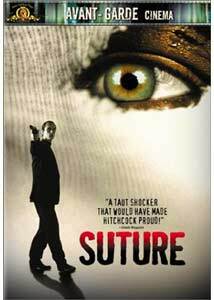 The writing-directing team of David Siegel and Scott McGehee (Lush), teamed with golden child Executive Producer Steven Soderbergh, assembled a fine cast for Suture. Haysbert (The Minus Man) is good as Clay, and his introspection and self-discovery are played solidly throughout. Clay is a confused man being forced to become someone that he is not. Mel Harris (TV's Thirtysomething) is Dr. Renee Descartes, the beautiful, concerned physician who treats Clay, and then becomes attracted to him. I'm lucky if I can get a doctor to spend more than five minutes with me, but her character seems to exist only for Clay. It is certainly no coincidence that Descartes is named after the 17th century French mathematician, philosopher, and physiologist who developed a philosophical distinction between mind and body. Dina Merrill, who was in one of my favorite TV moviesᓱs' Seven In Darkness, has a pivotal, though small, role. Sab Shimono (best known as the voice of Mr. Sparkle from The Simpsons) is Dr. Max Shimoda, the shrink who works with Clay to help discover who he really is. The downside of Suture is that even with all the clever uses of black and white, from cinematography to scenery to actors, the story is without surprise or suspense. The novelty of two racially different actors being identical loses steam fairly quickly, and I don't think it has anything to do with my blurred perceptions of black and white or any type of mind/body relationship. It just makes it easier to know who is Vincent and who is Clay, which actually works against the film. Had Clay and Vincent been played by the same actor, there may have been a sense of who was really who, which may have led to some type of actual suspense. Cronenberg's Dead Ringers is an example of how two identical characters can switch roles back and forth, and engage the audience. However, that was apparently not the intention of the filmmakers, and as a result, the point is somewhat lost. We know Clay is really Clay, not Vincent, but do we really care? We know the real Vincent will ultimately appear to finish the job. Suture is a very nice looking, well-acted film, but that is not enough to save it. The black/white message gets lost early on, and the end result is a less than compelling story that dies out well before the end. Image Transfer Review: The image transfer is decent, but a film like Suture demands it be pristine. So much of the overall impact is based on the cinematography, that anything less than pure black & white ends up detracting from what I imagine was the intended effect. Filming in black and white is art form unto itself, and the final product needs to reflect this or the presentation is doomed. Blacks are deep and solid, and I noticed very little bloom on the dominant whites, with almost nonexistent aliasing. The contrast is well balanced throughout, and most of this disc looks excellent. But it is not without imperfections. The credit sequences contain numerous scratches and nicks that mar the total image transfer. Audio Transfer Review: The surprisingly clean audio transfer is one of the few high points on this disc. This is not a six-channel, wall-rattling soundtrack experience, but it is subtle, effective and serves the film well. With only an English Dolby Digital 2.0 track to chose from, and nothing else, Suture is extremely limited in its options. Despite this lack of audio options, all dialogue is crystal clear and well-centered. The use of music (everything from Brahms to Johnny Cash) is mixed smoothly, and never overpowers the actors. The simple surround effects during Clay's dream sequences, as an example, seem all the more intense due to the somewhat restrained overall audio. Offering only one audio option is like Henry Ford's famous quote about the Model T - "You can have any color, as long as it's black." It's just not enough choice. Extras Review: This is the type of art house release that would really benefit from a commentary by Siegel and McGehee, if not Soderbergh himself. That type of extra would have been more interesting than Suture itself, as I imagine great effort was put forth to create and lens the proper film noir look. For example, the back cover of the DVD has three "Cinema Facts," one of which states that Phoenix was chosen as the locale because "the layout resembled an Rorschach blot —a device often used in the film." It's a sad day when the best 'extra' is available on the back of the case. I had high expectations of a disc loaded with engaging supplemental material. The Suture theatrical trailer apparently was the only item available to be deemed worthwhile. It is that type of short-sighted thinking by MGM that really weakens the impact of this film, and puts a black mark on the value of their entire 'Avant-Garde Cinema' series. I wanted to like Suture. I appreciated the attempt at being part of a clever, anti-convention film. It just didn't work. Suture tries too hard to be a smart art film, and doesn't succeed.